Rather than donating his collection to the State in return for the building, he continued to own the cars—and to add to their number until he had close to a hundred. He formed a corporation, The Melton Museum, Inc., and acquired a 10,000 square foot building on an eight-acre site on Route 7 in Norwalk, Connecticut, half a mile from the Merritt Parkway (where Wal-Mart is today). To that he added another 10,000 square foot building, incorporating an existing well-known restaurant, called the Stirrup Cup. On top of the building with the sign saying The Melton Museum, he put brightly painted cutouts of some of the cars represented in the collection; out front he placed a 1902 trolley car. 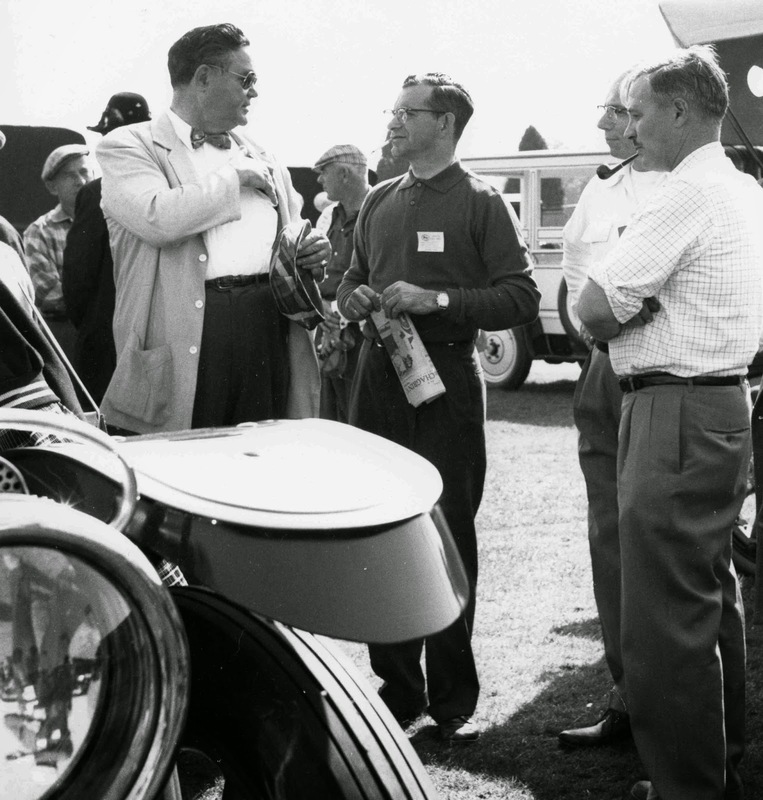 He sincerely believed that everyone was as interested in the history of the automobile as he was. He felt that preserving the cars was only half the story, they should be shown to the public as examples of man’s ingenuity and as the beautiful antiques they were. 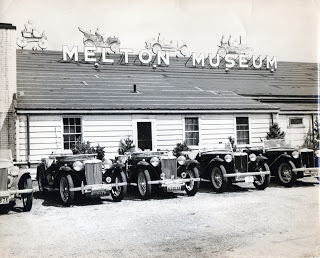 On July 24, 1948, the 20,000 square foot Melton Museum of Antique Automobiles opened in Norwalk, with fifty-five cars, antique bicycles, auto accessories, toy trains and music boxes. 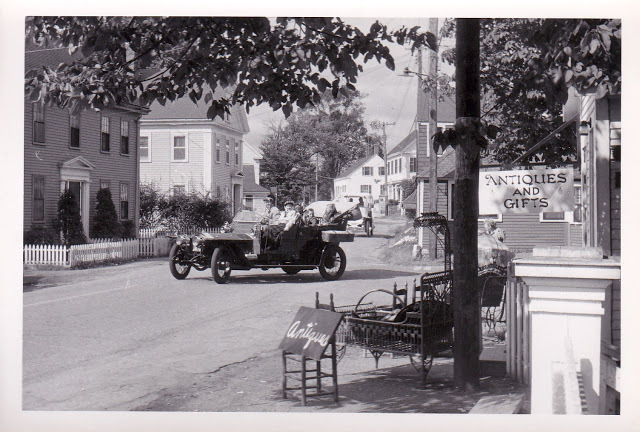 Opening day began with a parade of antique autos, driven by his confreres from the Veteran Motor Car Club, and was attended by celebrities such as Clare Booth Luce, Lawrence Tibbett and Connecticut Governor Grover Whelan. Twelve hundred paying customers came the first day, sixteen hundred the second. Little did many of the visitors know what a huge, last-minute effort had gone into readying the exhibition for opening day? Firestone, for instance, had agreed to equip all the cars with their new “non-skid” tires—the words formed the tread design. The tires had been flown in by air freight from Akron, Ohio the day before the museum opened, and Firestone men had worked until 2 A.M. to mount them all. For months my mother had been a willing helper in preparing the museum, haunting local antiques stores in search of the right accouterments to accompany the displays, and raiding friends’ and relatives’ attics for old-fashioned costumes for the mannequins to wear. She also oversaw many museum-related details on the home front while her husband was on tour with the Metropolitan Opera that spring. He hired a retired Norwalk policeman—Officer Phillip O’Grady—as the security guard. Dressed like a turn of the century Keystone Kop, O’Grady was straight out of central casting, and played his part to the hilt. Among the summer help my father hired was Joe Ryan, still only in high school, to polish brass and run errands. Over fifty years later, among the highlights Ryan recalled was a trip to Canada to pick up a 1924 Rolls Royce that Lady Eaton had donated to the museum. “Between being held up at the border for two days because Customs didn’t accept the paperwork I carried, (they had to verify it with both Lady Eaton and your father), and the fact the headlights were so dim I could only drive in daylight, it took me five days to get the car back to Norwalk.” His job at the Melton Museum started Ryan’s lifelong love of automobiles that evolved into his career as sales manager of a Mercedes Benz agency. The oldest car in the Melton Museum was 1893 custom steam stage coach, which looked rather like a horse-drawn carriage with engines added front and rear. The most modern car in the museum was a 1934 custom-built Detroit Electric. Other unusual pieces in the collection were aforementioned 1911 Mercedes of Vanderbilt Cup Race fame, a 1900 Rockwell Hansom Cab—the first New York City taxi— and a 12-passenger Stanley Steamer Mountain Wagon circa 1915, formerly used in Yellowstone National Park for sightseeing tours.